Sometime death comes as a surprise and sometime you know it is coming but it still takes you when it comes. Even when you watch a loved one health fail that finality of death can be so hard to accept. 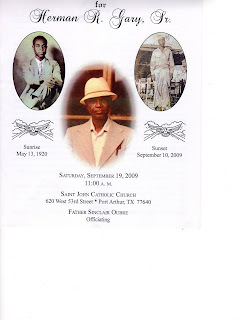 A month ago I visited my daughters grandfather and on Saturday, September 19, 2009 we laid him to rest. His heath had been failing for awhile and my visit along with talking to his son Stephen told me his days were numbered in my heart. Two weeks later I heard he was getting 24 hour care and two weeks later I got the call that he had passed. He was not just my ex's dad he was my friend. We began a friendship after Stephen and I separated. He was such a wise man sometimes I think he kept my friendship to insure I stayed close to his family. He would introduce me as his daughter n law although his son and I never married. I was his computer tech whenever something went wrong with his computer he would call me in Houston and ask when can I come see about it. And it would sit until I came to check on it....we would fuss, argue and discuss everything in the world from family, politics, community, love, life you name it. Sometimes my mom would get jealous of my time spent with Mr. Gary. He loved to share and his Louisiana heritage would be offended if you visited him and not accepted something he offered. It took me awhile to get it but soon I would accept his offer of a root beer soda, something he had grown in his garden, a fruit or a glass of Morgan David wine. I was also one of his many chauffeurs to the casino. I had patience with him and I allowed him to stay at the casino as long as he wanted. I always brought a book or an electronic game to occupy my time and he often teased me about it. I have been trying to remember his drink he would order I think it was Bourbon and Coke with a splash of milk. He loved his family and we spent many hours talking about his upbringing, his military life, his marriage, his wish for his grown children and his love to go to LALA's(zydeco). He was a spirtual man and although he didn't live in church he had a prayer life and no one interfered with his prayer time. I could tell him I would be there in 5 minutes and if he was saying his prayers I had to wait and then he would come open the door. His love of his grandkids showed as they all shed tears for his farewell. My daughter Lauren has a special memory because the farewell was on her 22nd birthday. She now has no grandparents living and made the comment that the two persons (my mom and Mr. Gary) who she knew were in her corner are gone ~ it is amazing how we can't get people to see how to cherish their elders and the time they have with them. That holds true for anyone now we much cherish every moment with all of our loved ones for TOMORROW IS TRULY NOT PROMISED. You are indeed truly blessed to have had such an influence for good in your life. May you be able to continue his legacy.